These words of the Venerable and Most Reverend Fulton J. Sheen remind us of an important truth when we consider the Blessed Virgin Mary: she is always pointing to God – it’s all about God and not about Mary. But, I hear you cry, we have come here to celebrate the Solemn Feast of Mary, Mother of God, surely it’s all got to be about her? Well I am sorry to disappoint you, but it isn’t. People who dislike Marian devotion, because it’s ‘a bit too ‘igh for ‘em’ or ‘it detracts from Jesus’, have got things wrong, and generally they err with how they understand one or all of the three Persons of the Trinity. For the last 1,582 years the Church has referred to Our Lady as the Mother of God, not the Mother of Christ, the Mother of Jesus, or some poor Jewish girl raped by a Roman soldier. The Mother of God, the Theotokosor God-bearer is her title which we celebrate today. The words we use matter. It matters that Mary bears in her womb the Word of God Incarnate, True God and True Man, for our salvation. We celebrate the wonderful truth that God shows his love for us in being born, in being a vulnerable child who needs a mother’s love and tender care. Mary is obedient and says ‘Yes’ to God – she is the model Christian, Mother of God and Mother of the Church, who as she stands at the foot of the Cross becomes our Mother too. At the Wedding in Cana she tells the servants ‘Do whatever he tells you’ she urges people to be obedient, to be close to God. She lives a life of faith: treasuring things and ‘pondering them in her heart’ so that we can be adopted children of God, and share in her Son’s gift of new life to the world. We honour her, because she points us to her Son. We rejoice that her obedience brings about the possibility of salvation in her Son. We love her because we love her Son, our God and Lord, Jesus Christ. If we honour him, how can we not honour she who bore him in her womb for our sake? If we believe that He is the Incarnate Word eternally begotten of the Father, and that they are con-substantial and co-eternal, true God and true man in two natures without confusion, change, division or separation, it surely follows that His Mother is the Mother of God. We rejoice that in her, the New Eve, the Ark of the new Covenant, the Tabernacle of the Most High, the possibility of new life in her Son has come about. So, today, let us pause to ponder the love of God shown to us in Mary, let us be fed by word and sacrament, the Body of Christ, which became incarnate in the womb of the Virgin Mary, let us treasure him, and let us respond by loving and trusting God, by living lives of service, of God and of one another, and proclaiming the Good News in Jesus Christ, so that all creation may resound with the praise of God the Father, God the Son, and God the Holy Spirit, to whom be ascribed as is most right and just, all might, majesty, glory, dominion, and power, now and forever. Christmas is a time for families, is a phrase with which I am sure we are all familiar. It comes as something of a shock to see that in a recent survey only 68% of British children live with both parents at the age of 14, with a quarter of children living in single-parent families. This is something about which we should be concerned for the simple reason that families matter, especially where the Church is concerned. It is not surprising that the Church sees the family as the domestic church, where parents and children should pray together and the Christian Faith should be taught – it should be a place where faith, hope, and love may abound. In our broken and fallen world we recognise that our human efforts may fall short of all that is expected of us, and as Christians we are not to judge others, as ours is to be a community of love, and forgiveness, and mutual support. We must nonetheless strive to do all that we can to see that something ordained by God – the lifelong union of a man and a woman for the procreation and education of children – given for human ﬂourishing, is something that can be cherished, supported, strengthened and lived out, as a witness to the world, so that it may believe. In this morning’s Gospel we see the Holy Family of Jesus, Mary and Joseph – the example for Christian families of what to be and how to live. Mary & Joseph show love and concern for their absent child, they search for him. Jesus’ response may seem troubling at ﬁrst; it doesn’t look like the response of a dutiful child. It does, however, point out the important truth that our ﬁrst duty as children is not towards our parents, but to God – to love him and serve him. But as Our Lord ‘went down with them and came to Nazareth and was submissive to them’ he shows that he is obedient both to God andhis parents – his obedience show us how to live a Christian life after his example. His mother ‘treasured up all these things in her heart’ as she comes to see and understand what is going on – the family grows in love towards God and each other and becomes a place of human ﬂourishing and an example to the world of how to live the life of faith. Mary and Joseph ﬁnd Jesus after three days – a period of time which looks forward to His Death and Resurrection – even here and now as a young man, his life points towards its goal: the Cross and the Empty Tomb which gives life to all creation in Him, through Him and with Him. God gives us life in Christ so that we may live it and may ﬂourish, where we can truly be what God wants us to be, and so that strengthened by Word and Sacraments we may become what he is. In the First Letter of John we see our relationship with God in terms of a family – the Father loves us and we are His children, not just called such, but through the new birth of our baptism this is what we are. The world does not recognise this, just as it did not recognise our Lord, or indeed follow him. The world may just want to see us in worldly terms or have us conform to worldly values, but we cannot allow this to happen – we are called to conform the world to the will of God, to show it how it may truly ﬂourish and ﬁnd its true meaning and value. The world will no doubt hate us for doing this, but this should not dissuade us from trying, and indeed succeeding, as we are one in Christ, who has overcome the world. So let us live lives of faith, hope, and love, after the example of the Holy Family, and aided by their prayers, so that the world might believe and all creation resound with the praise of God the Father, God the Son, and God the Holy Spirit, the consubstantial and co-eternal Trinity, to whom be ascribed as is most right and just, all might, majesty, glory, dominion, and power, now and forever. Christ’s coming into the world was not like that of a sightseer to a strange city, but rather like that of an artist visiting his own studio or an author paging the books he himself has written, for in becoming incarnate, the divine Word was tabernacling himself in his own creation. It is a strange time to be a Christian. We live in a world where scepticism abounds, where trust is in short supply, and where the yearly celebration of Our Lord and Saviour’s Nativity has become an excuse for consumerist excess. In the midst of all the madness and froth of our modern existence, I’d like to take a few minutes to explore the profound mystery which we celebrate tonight. In a stable attached to an inn, in a backwater town in the far corner of the Roman Empire, a woman gives birth to a son. It is a birth which has been foretold by the prophets: salvation will come from Bethlehem, the town of David, and from the line of David. Unlike the ﬁrst David, who sends a man (Uriah the Hittite, the husband of Bathsheba) to die, so that he may sin, the second David will gladly die to save all humanity from its sins, even those who kill him. The ruler and shepherd of Israel will reign in glory hanging from a tree like a common criminal. The ﬁrst people to come and worship him are shepherds, ritually impure men, outcasts from Jewish society. It is a life that begins and ends on the margins, among those whom the world despises and casts aside. This doesn’t look much like how the world understands glory, indeed it doesn’t look much like how the world understands God, and that is, I suspect, the point. If we try and understand what we are celebrating in purely worldly terms then we will go horribly wrong. As he ponders the mystery of Our Lord’s Incarnation, St John begins at the beginning, taking us back to the beginning of Creation so that we may discern the loving purposes of God, in the midst and messiness of human history. It ends with the last of the prophets, John the Baptist, the forerunner who even in his mother’s womb leaps for joy to announce the coming of the Saviour of the World. He bears witness in his life that all might believe: he sets us the example of how to live a Christian life – we are in all things and at all times to bear witness to Christ, the Saviour of the World. It may cost us dear – imprisonment, torture and even death, but throughout the entire world and for all of the last two thousand years Christians have done just this, to bear witness to the truth regardless of the cost, so that the WORLD may believe. The world knew him not, and still fails to know him, to recognise him, but their failure does not mean that we should lessen our efforts; rather we should proclaim the saving truth of God’s love all the more and live lives which embody that truth and make it real and visible to the world, which make it credible, trustworthy, and attractive. To those who received him he gave power to become children of God – through faith we enter into a relationship with the God who creates, who redeems and who loves. It isn’t about giving our assent to philosophical propositions – the salvation of humanity is not about logic, but love. And the Word became ﬂesh, and dwelt among us (and we beheld his glory, the glory as of the only-begotten of the Father) full of grace and truth. The Word becomes ﬂesh – God becomes a human being in the womb of a virgin, ‘the invasion of time by eternity’. God tabernacles among us and the womb of the Blessed Virgin Mary, the Mother of God, becomes the Ark of the New Covenant for the New Israel, the People of God. God gives us a life to live – with Him and each other, a relationship through which we may grow, fed by His Word and Sacraments, so that His grace may perfect our nature and that we may live that divine life of love poured out on the world in His Son and the Holy Spirit, so that the world might believe and all creation resound with the praise of God the Father, God the Son, and God the Holy Ghost, the consubstantial and coeternal Trinity, to whom be ascribed as is most right and just, all might, majesty, glory, dominion, and power, now and forever. 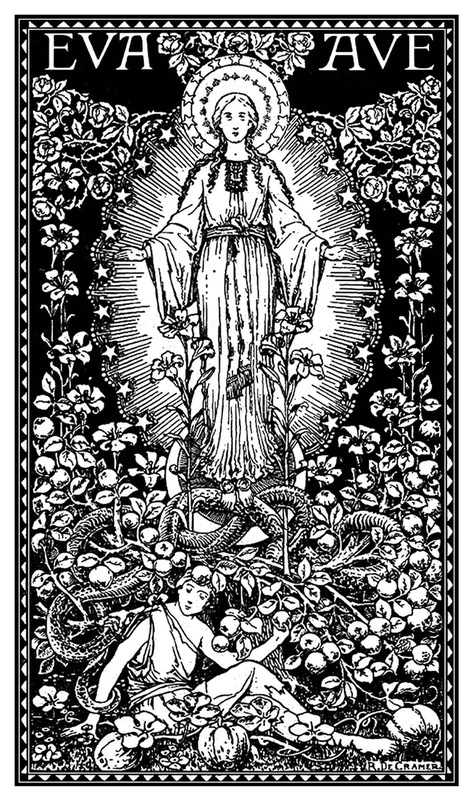 Homily for Advent IV Year C : ‘Blessed are you among women, and blessed is the fruit of your womb! The prophet Micah, after the destruction of Samaria, looks back to David of the tribe of Ephraim, to look forward to the saviour who will save Israel, who will be a true shepherd to his flock, who will bring Peace. Whereas the first David sinned by sending a man to die, Uriah the Hittite, the husband of Bathsheba, the second of David will go to his death willingly to save from their sins even those who kill him. Prophecy is fulfilled, humanity is restored, and the peace of God’s kingdom can be brought about. His coming forth is from old from ancient days. Our salvation is the fulfilment of prophesy and the outworking of God’s love. In the letter to the Hebrews we see the prophecy of Psalm 40:6-8 fulfilled in Christ. The sacrifices of the old covenant are replaced in the new covenant with the sacrifice of God for humanity: sacrifice is fulfilled and completed, once and for all. It is this sacrifice, which the church, through its priests of the new covenant pleads and re-presents: the eternal offering of a sinless victim, to free humanity of its sins, to restore our relationship with God and one another. It is an act of perfect obedience: the body prepared by God for Christ will do his will and will sanctify humanity, heal us and restore us. In this morning’s Gospel Mary does not tell Elizabeth that she is pregnant. But by the power of the Holy Spirit John the Baptist, the forerunner, the last of the prophets announces the coming of the saviour by leaping of the joy in his mother’s womb. It’s important, there’s no time to waste: Mary arose and went with haste. Time is of the essence, not for the frantic fulfilment of consumerism: last-minute presents, or enough food to satisfy even the most gluttonous, no, we have to prepare our hearts, our minds, and our lives, so that Christ may be born again in us, so that we may live his life and proclaim his truth to the world. Through the prompting of her son and the gift of the Holy Spirit, Elizabeth can cry ‘Blessed are you among women, and blessed is the fruit of your womb!’ She recognises that Mary’s obedience, her humble ‘Yes’ to God undoes the sinfulness of Eve. That she who knew no sin might give birth to Him who would save us and all humanity from our sin. It is through the love and obedience of Mary that God’s love and obedience in Christ can be shown to the world, demonstrated in absolute perfection, when for love of us he opens his arms to embrace the world with the healing love of God. He will be the good Shepherd, laying down his life for his flock that we may dwell secure. We prepare to celebrate Christmas because it points us to the Cross and beyond, in showing us once and for all that God loves us. Safe in the knowledge that God loves us, that he feeds us with word and sacrament, that he heals us, let us love God and love one another, truly, deeply, with all our lives. Let us prepare the greatest gift we can, ourselves: that Christ may truly be born in us, that as the Sanctified People of God, we may live that goodness, that holiness, that charity, which reflects the bountiful goodness of God who gives himself to be born and to die and rise again that we might truly live and have life in all its fullness, sharing the joy and the love of God with everyone we meet. As he will come to be our judge let us live His life proclaim his saving love and truth to a world hungry for meaning and love and thereby honour God the Father, God the Son, and God the Holy Spirit, the consubstantial and co-eternal Trinity, to whom be ascribed as is most right and just, all might, majesty, glory, dominion, and power, now and forever. John the Baptist has been preaching a baptism of repentance, a turning away from sin towards the arms of a loving God. He has been stark and uncompromising and the people to whom he has been preaching find themselves in an awkward situation. Some 2000 years later we find ourselves asking very much the same question, ‘What then shall we do?’ The world, the state, the church all seem to be in a mess. The peace which the Messiah came to bring it seems as elusive as ever, whereas the human capacity to create misery in the most dreadful ways makes us realise that we still have some considerable distance to travel. One possible answer is the need for repentance: to change our hearts and minds and to follow Christ. Our readings this morning speak of the kingdom of God, the God who is in our midst, a mighty one who will save us; he will rejoice over us with gladness; he will quieten us by his love. In all our sadness and sin, we look forward to our yearly remembrance of our Lord’s incarnation. We prepare our hearts, our minds, and our lives, to go to Bethlehem, to see God come into the world naked, vulnerable, and homeless. We prepare to meet him as he will come again, as our saviour and our judge, daunting though this may be, in the knowledge and trust that he saves us, that by his wounds on the cross we are healed. We are to rejoice, strange though it might seem, just like the people of Israel in captivity, since the Lord God is our strength and our song and has become our salvation. We draw living water, the water of baptism, which saves us. In the midst of our sorrow we are to place all I hope and trust in God who loves us, and who saves us. We are to rejoice, because as S. Paul reminds the Galatians joy is a fruit of the spirit. As the people who have received the spirit in the sacrament of baptism, of confirmation, or indeed of holy order, our joy in the Lord should set our hearts on fire, with love for him and each other; we shouldn’t worry about anything, but instead we should trust in God: the God whose peace surpasses all understanding. We are to share this joy with others, to share the good news of Jesus Christ to all people, and not just in our words but our deeds. If we share what we have, if we are generous, if we work for justice and are clothed with humility, showing our joy in mutual love, God’s kingdom will be advanced. We, here, now, know that Jesus will come and will judge us by the standard of love which he set for us to follow. Let us trust God and share that trust in prayer, that his will may be done, and that he may quieten us with his love. The world around us is full of pain and anguish, and the only way for it to be healed is in Christ, who was bruised for our transgressions and wounded for our iniquities. He still bears those wounds as the wounds of love. As he flung out his arms on the cross, so he longs to embrace the world and fill it with his peace and love. He will not force us; he is no tyrant in the sky. It is the world which must turn to him in love and in trust, and turn away from sin. Our task is always only all things to be joyful in the Lord, and to live out our faith to help the world turn to him. It isn’t an easy thing to do, and after 2000 years of trying we may seem as far away as when John proclaimed the coming of God’s kingdom . We can just give up, or we can try, and keep trying, no matter how many times we fail, secure in the knowledge that God loves us and forgives us, and that we are to do the same to each other. That in this and all things we may give glory to God the Father, God the Son, and God the Holy Spirit, to whom be ascribed as is most right and just, all might, majesty, glory, dominion, and power, now and forever. Many people nowadays want God, but on their terms, not his. They insist that their wishes to determine the kind of religion that is true, rather than letting God revealed his truth to them. So their dissatisfaction continues and grows. But God finds us lovable, even in our rebellion against him. God does not love us because we are lovable of and by ourselves, but because he has put his own life into us. He does not even wait for us to love; his own love affects us. Letting it to do this, with no resistance, no holding back for fear of what our egotism must give up, it’s the one way to the peace of the world can neither give nor take away. As God was physically formed in Mary, so he wills to be spiritually formed in you. If you knew he was seeing through your eyes, you would see everyone as a child of God. If you knew that he worked through your hands, they would bless all the day through …. If you knew that he wants to use your mind, your will, your fingers, and your heart, how differently you would be. If half the world did this there would be no war! The prophets proclaim the message of hope to Israel, in the midst of exile, when times look dark, they are to wrap the cloak of integrity around themselves, and put the crown of the glory of God upon their heads. It is the message of trust, trust in God alone as the source of our hope, the only rock on which to build a life of faith. As the people of God we are to trust in him and to live lives which prepare for the second coming of our Lord and saviour Jesus Christ, our saviour and our judge. To be a Christian, then, is to live a life where our love for each other and for God increases day by day as Paul puts it. We are to grow in virtue by being virtuous. In this morning’s gospel we see the last of the prophets, John the Baptist, the son of Elizabeth and Zechariah, as he prepares the way for the Lord. He proclaims a baptism of repentance for the forgiveness of sins. In our baptism we promise to turn away from sin, the world, and the devil; we turn away from what the world thinks and does, because our baptism makes us pure and blameless, following the Commandments of God, and shown to us in the life of Jesus Christ. The church, then, must be a voice crying in the wilderness. What we proclaim may well be at odds with what the world thinks we should say and do, but we are not called to be worldly, to conform ourselves to the ways of the world. We live in a fallen world, which is not utterly depraved, but the church exists to conform the world to the will of God. To say to the world, come and have life in all its fullness, turn away from selfishness and sin, to have life in all its fullness in Jesus Christ. The world may not listen to us when we proclaim this; it may well choose to ignore us, to persecute us. We have to be prepared to do this regardless of the cost. We must bear witness to God the Father, God the Son, and God the Holy Spirit, and their saving work even if it means shedding blood of losing our lives, because it says to the world: we trust in something greater than you, we know the truth and it has set us free, free to love God and to serve him, and to invite others to do the same, to be baptised, to turn away from the world, and be fed by word and sacrament, built up into a community of love, offering the world a radical alternative, and holding fast to the truths which the church holds dear, since they are given us by God. It’s a big, a daunting task, which if it were up to us individually, we would have no chance of achieving. But it is something which we do together, as the body of Christ, and relying upon God alone: it is his gospel, his church, and his strength in which we will accomplish this. Too often we trust in ourselves and fail, we need to trust in God and ask him to bring about the proclamation of the Gospel through us. We need to be like John the Baptist, preparing the way for the Lord who will come again as our Saviour and our Judge. This is what we await in Advent, the coming of Our Lord as a baby in Bethlehem and his second coming as Our Judge, bearing in his glorious body the wounds of love, borne for us and our salvation. So let us prepare to meet him and live lives which proclaim his saving love and truth to a world hungry for meaning and love and thereby honour God the Father, God the Son, and God the Holy Spirit, the consubstantial and coeternal Trinity, to whom be ascribed as is most right and just all might, majesty, glory, dominion and power, now and forever. These words of the Venerable and Most Reverend Fulton J. Sheen remind us of an important truth when we consider the Blessed Virgin Mary: she is always pointing to God – it’s all about God and not about Mary. But, I hear you cry, we have come here to celebrate the Feast of the Immaculate Conception of the Blessed Virgin Mary, surely it’s all got to be about her? Well I am sorry to disappoint you, but it isn’t. We are not here today to celebrate a doctrine, or a philosophical concept, because that is not what the church does. We celebrate a person, and through her, God. Mary, the spotless vessel, through whose loving obedience our Lord and Saviour Jesus Christ became incarnate and was born, for the salvation of all humanity, is marked out for a life of perfect love and obedience. She becomes the first Christian, the tabernacle, the Ark of the new covenant, the new Eve, Mother of God and Mother of the Church. In her response to the angel’s message Mary becomes totally open to God, totally vulnerable and totally reliant upon him alone. In her openness and her vulnerability there is the space in which God can be at work. In Adam and Eve we see how sin can separate us from God. In Mary we see how God begins to put that right. From the moment of her Conception she lives the life of the baptised: filled with sanctifying grace, united with God, because of what her Son will do. She is the model of what humanity can be, she gives us hope as Christians, and points us to her Son, Our Lord and Saviour, whose coming as our Judge and as a baby in Bethlehem we prepare for in this season of Advent. Mary trusts in God, she says ‘yes’, and is filled with love, a gift which must be shared. She offers the church the perfect example of how to live a Christian life, in joyful hope and obedience: at the Marriage in Cana she says to the servants ‘Do whatever he tells you’. She stands at the foot of the Cross and watches her Son die to reconcile God and humanity. But in her joy and her sorrow she is truly free, to love and serve God. She is freed to show us, as Christians, how to live our lives loving and serving God and one another, and to show us the wonderful work of her Son who frees all humanity, who saves them, and who loves them. So, today, let us pause to ponder the love of God shown to us in Mary, let us be fed by word and sacrament, the Body of Christ, which became incarnate in the womb of the Virgin Mary, let us treasure him, and let us respond by loving and trusting God, by living lives of service, of God and of one another, and proclaiming the Good News in Jesus Christ, so that all creation may resound with the praise of God the Father, God the Son, and God the Holy Ghost, to whom be ascribed as is most right and just, all might, majesty, glory, dominion, and power, now and forever. In Spiritu tuo ad gloriam Patris. in thy spirit, for the glory of the Father. The world and the church have a picture of St Nicholas, it is a safe picture, he is a kindly man, a Bishop with a big white beard, who gives presents to children and does lots of lovely things. That’s all well and good, and there is much that can be said about the gentleness and generosity of the man, and how that points us to Christ. But recently I have found myself pondering another aspect of this great Saint. At the first ecumenical Council of Nicaea in ad325, Nicholas, Bishop of Myra slaps Arius for denying the coeternal and consubstantial nature of the second person of the Trinity, Our Lord and Saviour Jesus Christ. Nicholas got angry and his fellow bishops and the Emperor Constantine didn’t exactly approve of the pugilist prelate. If it were to happen today I could imagine the media outcry, Twitter would be flooded with #bishopgate and #TeamArius posts. No doubt some eminent theologian would state that it’s perfectly alright to say that ‘there was a time when he was not’ and that Adoptionist or Subordinationist positions are all equally valid points of view and that one Christology is as good as another, that this was Arius’ truth and it needs to be affirmed, that we need to feel his pain and resist the patriarchal oppression of an authority figure like Nicholas and so on. 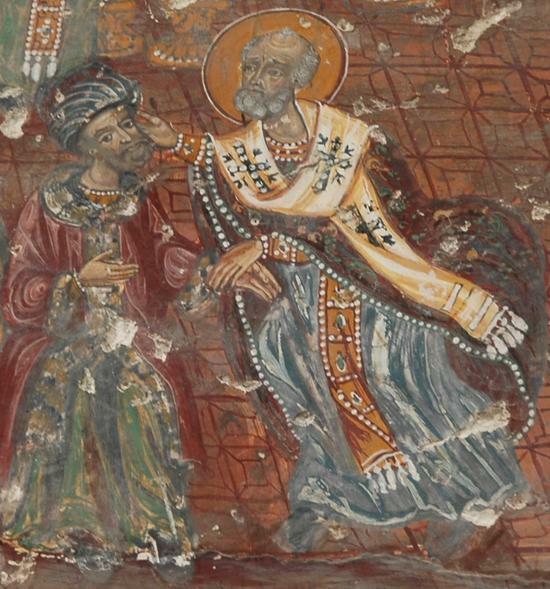 Nicholas slaps Arius because orthodoxy really matters, what we believe about God and the Church really matters. The Word of God, who was with his Father in eternity, before all time, and matter, and space, becomes incarnate in the womb of the virgin, for the salvation and redemption of all humanity: true God and true man, consubstantial and coeternal. It may be easier to deny this, it may make more sense, or be consistent with a philosophical position, but it will not do. As St Ambrose put it: non in dialectica complacuit Deo salvum facere populum suum (it was not the will of God to save his people through dialectic) [De Fide 1:5, §42]. The Incarnation is a scandal and a mystery which defies human understanding and intellect, reason and philosophy it is something to be experienced, to be tasted and felt. This is what we await in Advent, the coming of Our Lord as a baby in Bethlehem and his second coming as Our Judge, bearing in his glorious body the wounds of love, borne for us and our salvation. So let us live lives which proclaim his saving love and truth to a world hungry for meaning and love and thereby honour God the Father, God the Son, and God the Holy Spirit, the consubstantial and coeternal Trinity, to whom be ascribed as is most right and just all might, majesty, glory, dominion and power, now and forever. I don’t know if you’re anything like me, but at any time of year and especially now with the dark mornings, I can be somewhat reluctant to leave my bed. It’s nice, it’s warm, and it’s comfortable. So when I hear the words ‘now it is high time to awake out of sleep’ I want to reach for the snooze button. It is sad to say that for many people their spiritual lives can be a bit like this: it’s a bit too much effort, can we really be bothered? But this is what we need to do: Advent is after all a season of preparation, of turning away from the world and sin, and preparing to meet the Son of God, who is born in Bethlehem and who will come to be our judge. We may not be able to recognise the signs, we may not know when it is going to happen, but as we have celebrated the Universal Kingship of Our Lord and Saviour Jesus Christ, we know that he will come again in glory to judge both the living and the dead. He fulfils prophesies but also proclaims the kingdom in word and deed and overthrows the tables in the temple. This doesn’t mean that the Cathedral Gift Shop is an abomination, but rather that the Church needs to be vigilant. When a house of prayer becomes a den of thieves the interests of the world have taken over; when the Church is conformed to the ways of the world, when it seeks the world’s approval or bows to its will, it sells the Gospel short and for that it too will be judged and found wanting. The only solution is to be found in Christ. It is he whom the church must put on, his is the standard by which we will be judged. Note also that love is the fulfilling of the law. The law is not abolished in Christ, but rather it is fulfilled, its meaning is deepened. It is through the framework of the Law and the Prophets that we can hope to understand who and what Christ is and what he does. It is our frame of reference; truth is revealed in and as the Word of God. So we are called to ‘cast off the works of darkness and to put on the armour of light’ we are to turn away from sin, from the ways of the world and walk in the way of him who is the Light of the World. We are to watch and pray, and to live lives which proclaim the truth of God’s saving love in Christ. We are to treat our lives on this earth as a preparation for the life to come, not because we can earn salvation through our works, but because in living Christ-like lives we conform ourselves to the will of God, we show the world how we love and serve God, our lives have true meaning, and we truly flourish as human beings. So let us lose our lives in order that we may truly find them in Christ, let us live out our baptism when we are clothed with Christ. Let us be fed with him, in Word and Sacrament, turning away from our sins, and looking to him to heal us and restore us, to prepare us to be with him forever, contemplating the vision of God the Father, God the Son, and God the Holy Ghost, to whom be ascribed as is most right and just, all might, majesty, glory, dominion, and power, now and forever.